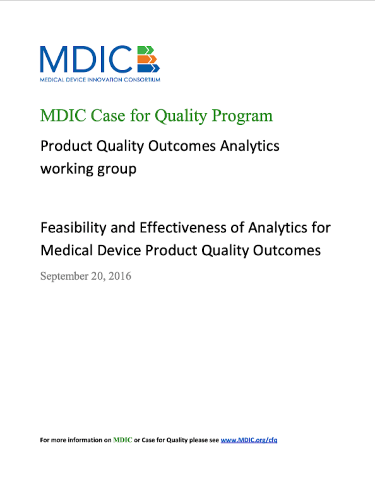 The Case for Quality (CfQ) Program offers a unique opportunity for medical device stakeholders to work together to enhance device quality and patient safety. This program allows the FDA to identify device manufacturers that consistently produce high-quality devices which enables the Agency to allocate its resources to assist other manufacturers with increasing their level of quality in devices. MDIC’s partnership enables the organization to help the FDA with recognizing and supporting practices that encourage consistent quality manufacturing. An analysis of use of various Quality Maturity Models in industry and recommendations on how a model could be used in the medical device industry. Ongoing Case for Quality Forums to provide discussion of key areas of improvement needed for the medical device industry. Identification and visibility to projects aimed at fixing prioritized issues identified by the Forum to ensure development of an improvement of key quality metrics. Creating resources that depict changes needed to improve overall level of product quality which will benefit a broad group of stakeholders such as hospitals, payers, health care provides, and patients. In 2011, FDA launched the Case for Quality to elevate the focus of all medical device stakeholders from baseline regulatory compliance to sustained, predictive practices that advance medical device quality and safety to achieve better patient outcomes. Upon an in-depth review of device quality data and feedback from regulatory and industry stakeholders, the FDA’s analysis flagged manufacturing quality risks. Findings also showed that firms that manage those risks by driving quality organization-wide are more productive, with fewer complaints and investigations per batch, and often with smaller quality units with lower quality-related costs than their competitors. A cultural shift of this magnitude demanded the engagement of regulators, industry, providers, payers and patients, so in 2014, FDA enlisted MDIC to foster a new level of collaboration between the FDA and medical device industry in a far-reaching Case for Quality movement. 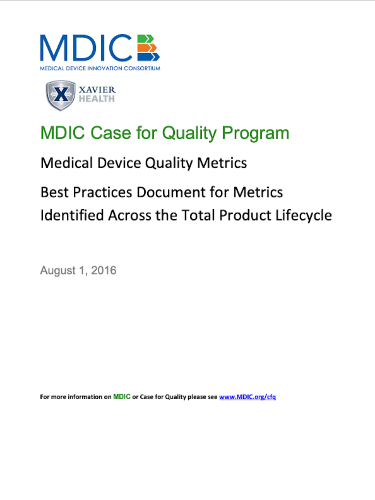 MDIC’s Case for Quality is setting a cultural shift in motion to focus the medical device ecosystem on sustained product quality that enhances patient safety and outcomes and adds value to stakeholders’ organizations. Through the collaboration of ongoing working groups representatives from FDA and medical device manufacturers of every size are developing practices, tools and metrics to enhance product design and manufacturing processes and inform regulatory practices.